My preschoolers are all about the play dough mats lately! It has worked to my advantage because of all of the play dough mat choices and skills focused on in our printable centers and busy bins. Play dough is so inviting for little learners and encourages fine motor practice. 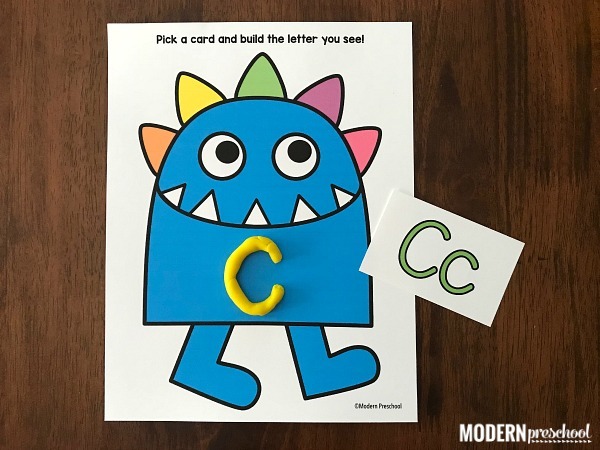 Our monster alphabet play dough alphabet mats is the perfect learning center to practice uppercase and lowercase letters including letter formation. 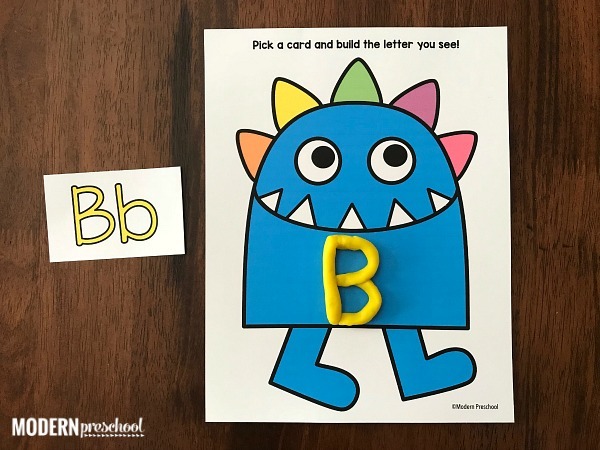 This free printable set includes a monster play dough mat and 26 letter cards. The letter cards include an uppercase and lowercase letter. Prepping this activity takes no time! Simply print the set from the bright pink button below. Cut the alphabet cards apart on the gray dotted lines and then laminate the set. When using the monster alphabet play dough mats in my classroom, I print 4 play dough mats for the center. Then I put all of the alphabet cards in a mini bucket in the middle of the table for each preschooler to pick from. To play, pick a letter out of the bucket and identify it. 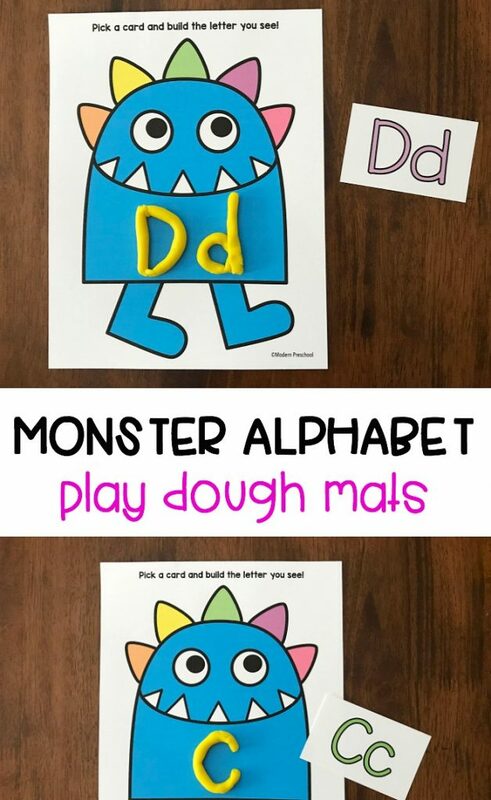 Build the uppercase and lowercase letter with play dough on the monster’s belly. Focus on rolling the play dough out into a snake and then bending it to form the shape of the letter. Pinching apart smaller pieces helps too! After the letter is complete, pick another card and play again! This activity can easily be adapted to fit the needs of multiple leveled learners in the same classroom. Draw a red line with dry erase markers under the uppercase letters on the card. Draw a blue line under the lowercase letters. Make it clear to the different groups visiting the center which letters to work on — red, blue, or both. This will also allow the center to be independently worked at. Use these play dough mats around Halloween time, when learning the letter M, or during fine motor Fridays! 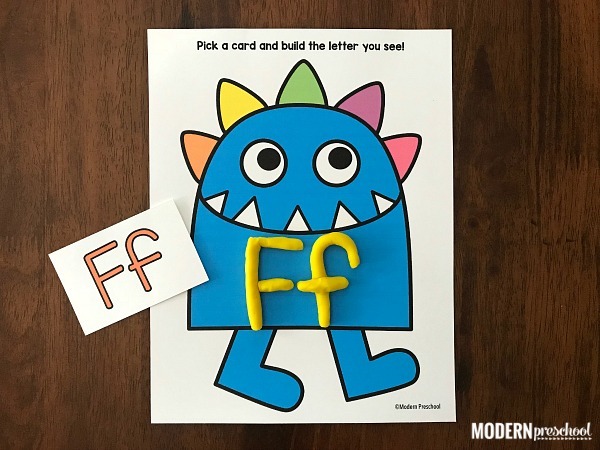 You can find the file to print this monster alphabet play dough set below. 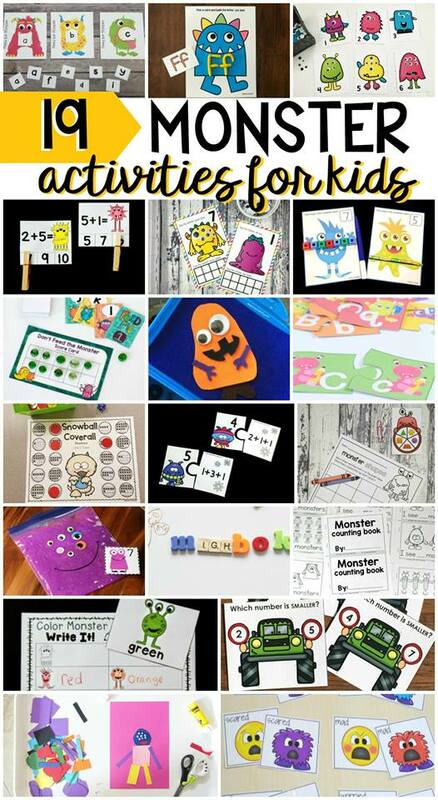 Now you have to check out these super fun learning activities from some of my favorite bloggers! How great is it to have so many related activities in one place? !